We filed a Freedom of Information Act (FOIA) lawsuit against the U.S. Department of Veterans Affairs in US District Court, Southern District of New York (SDNY), on September 17, 2018. The case is still pending. 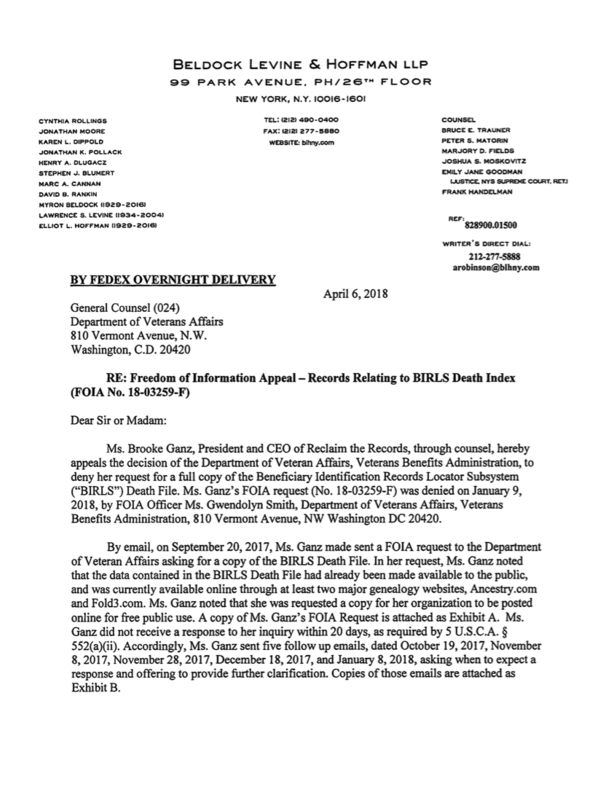 In September 2017, Reclaim The Records made a Freedom of Information Act (FOIA) request for a copy of what is colloquially called the BIRLS File from the United States Department of Veterans Affairs. This is a Veterans Benefits Administration database that provides information on deceased individuals including name, birth and death dates, branch of service, and enlistment and release dates. 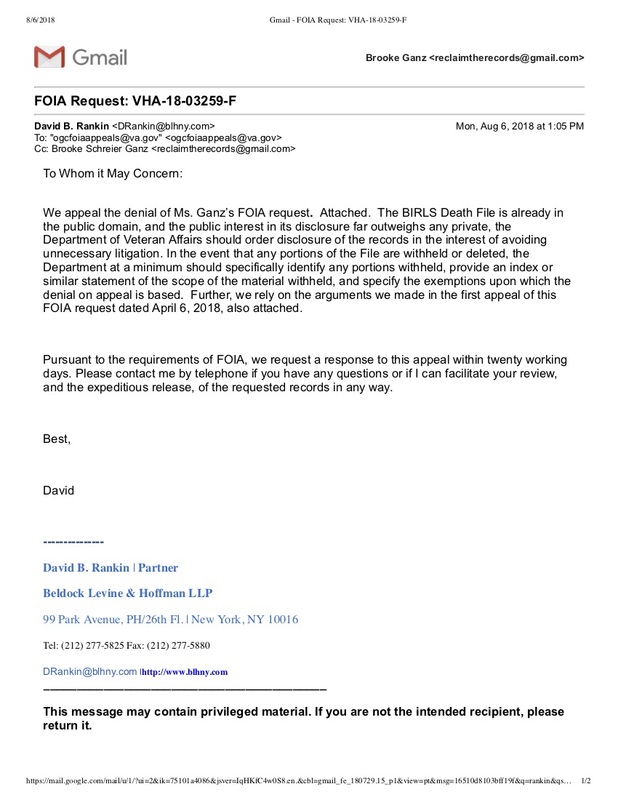 This request was one of the first two FOIA requests our organization had ever made for a nationwide database under the federal FOIA, rather than a state-level law such as a state Sunshine Law. I represent a 501(c)(3) non-profit organization called Reclaim The Records. We are an activist group of genealogists, historians, journalists, and open government advocates who acquire genealogical and archival data sets and images from government sources, often through the use of Freedom of Information laws. We then upload those records to the Internet, making them freely available to the public and returning them to the public domain. We request a copy of the Beneficiary Identification Records Locator Subsystem (BIRLS) Death File, a very large database maintained by your agency. This data has already been made available to the public before, and it is currently online at at least two major commercial genealogy websites, Ancestry.com and Fold3.com. We are now requesting a copy for our organization, so that we may post it online for free public use. We would also like to recommend that your agency upload a copy of the file to the federal government’s open data portal, data.gov. 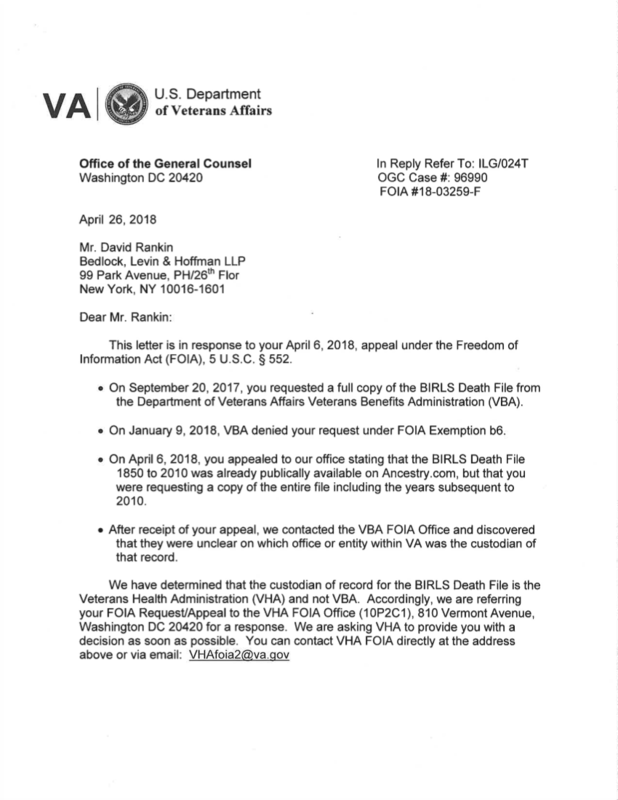 …it seems that the BIRLS Death File has the VA Item Number 08-065 000, and a copy may have already been turned over to the National Archives and Records Administration (NARA). We request that this file be turned over to us in database format, as it already exists in a database. We would like to receive it on a portable USB drive, and we are willing to pay the costs for purchasing that drive and for its insured and trackable domestic shipping, as well as any fees associated with fulfilling this request. Please inform us of all fees in advance of fulfilling our order. Thank you for your consideration, and we look forward to your timely response within twenty business days, as the statute requires. The request was originally rejected by the VA for privacy reasons on April 6, 2018 (PDF). But after our attorney contacted the agency, they wrote us a new letter on April 26, 2018 (PDF) where they said they would be referring the issue on for further study in a different department, rather than closing the request. 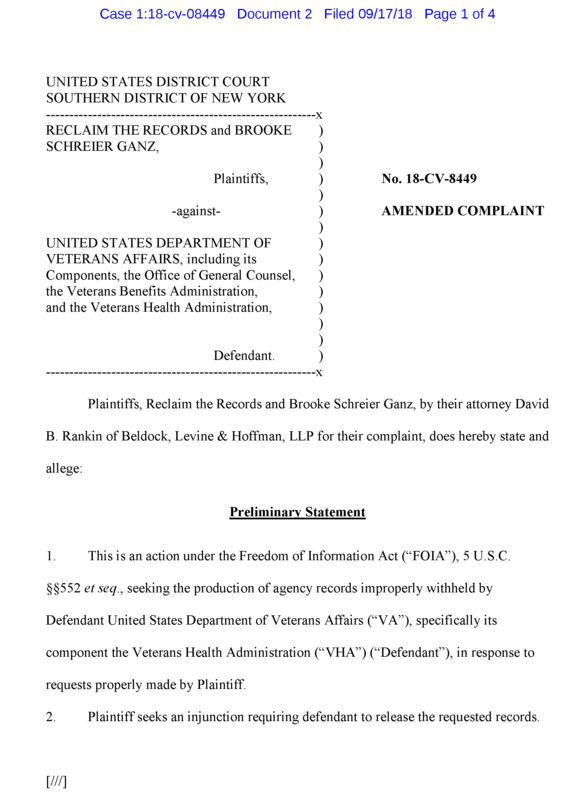 On July 26, 2018, the VA wrote again, denying the records for the second time (PDF). This time, they claimed to us that the BIRLS database had been “erroneously” been released to Ancestry.com on March 18, 2011 pursuant to FOIA request number 10-02722-F, and that they didn’t want to release the data to us, too. They also claimed that this BIRLS database release amounted to “a data breach of Veteran’s personal information” — which seems rather unlikely given that everyone in the database is, by definition, dead. And so, on August 6, 2018 we appealed the second denial (PDF), for much the same reasons as we had the first denial. We did not get a response. 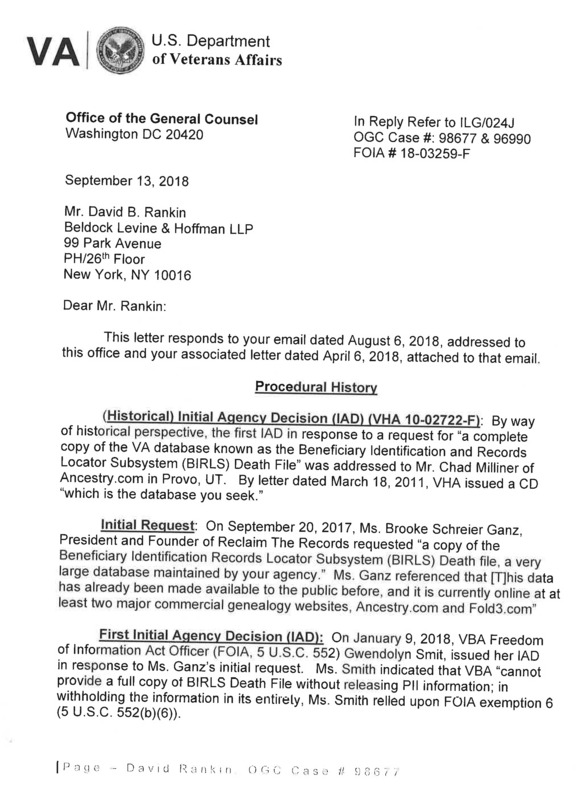 On September 17, 2018, Reclaim The Records sued the US Department of Veterans Affairs in US District Court (SDNY) for the BIRLS Database. The case is still pending. Our lawsuit continues, and we look forward to winning the first free public release of this important database about veterans. We appealed the VA's denial for the first time on April 6, 2018. 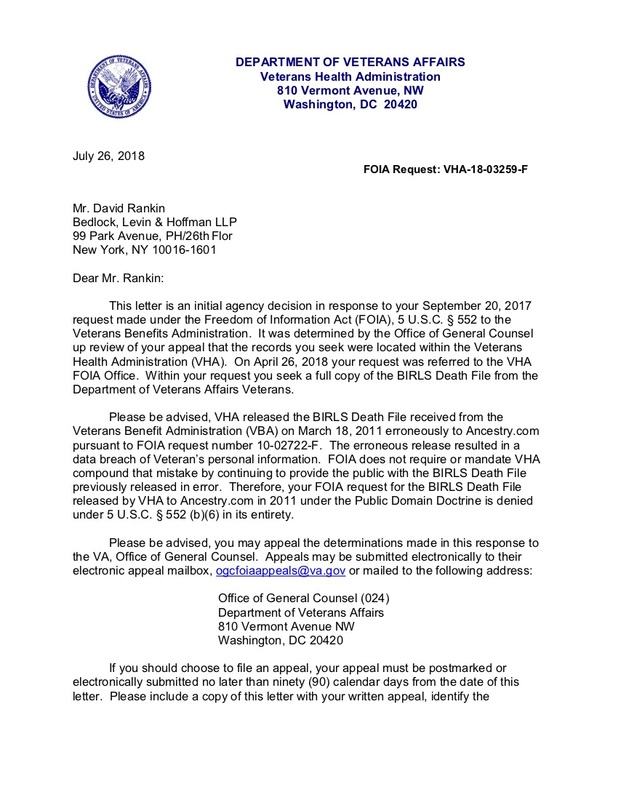 After receiving our FOIA Appeal, the VA suddenly decided that they had sent the FOIA to the wrong agency, and redirected it to a different group. We appealed the second denial, too. And here's the FOIA lawsuit, filed in US District Court (SDNY) on September 17, 2018.